Clean chicken, cut off excess fat, and chop chicken into medium sized pieces. Salt to taste. Clean vegetables (onion, green pepper, and mushrooms) and chop into medium sized pieces. Fill pot with half gallon of water, bring to boil and add salt. Add spaghetti and cook for 10-12 minutes (until al dente). Once cooked, drain pasta, reserving 1 cup of pasta water. Dredge chicken pieces in flour (enough to coat). Shake off chicken flour and set aside. Warm medium sized skillet over medium-high heat. Once pan is hot, add 2 tbsp of butter and add chicken. Cook for 5-6 minutes till chicken is browned on the outside and more than half cooked. Add chopped vegetables and cook for 6-7 more minutes, until tender. Drain chicken and vegetables and wipe excess butter from skillet. Add chicken and vegetables back in skillet. 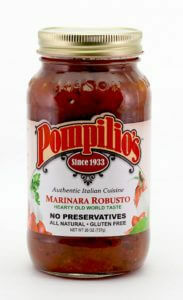 Add Pompilio’s Robusto Marinara and reserved pasta water to loosen sauce. Once sauce is hot, set aside. Place drained pasta on each plate and cover with cacciatore sauce and serve.